Connecting Principle is an art centred international multi-disciplinary research forum at Newcastle University instigating a dialogue between art and other disciplines. The aim of the forum is to increase opportunities for interdisciplinary collaboration within academia and independently. Connecting Principle sees itself as an international network of artists, theorists and researchers. Our current activities feature a series of presentations, round table discussions and an annual event that showcases the recent projects and collaborations of our members. 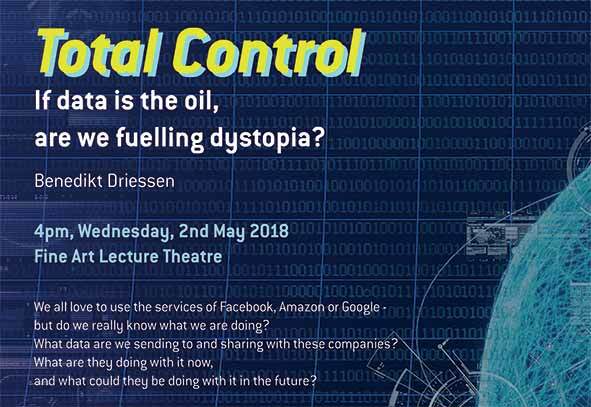 If data is the new oil, are we fuelling dystopia? We all love to use the services of Facebook, Amazon or Google - but do we really know what we are doing? What data are we sending to and sharing with these companies? What are they doing with it now, and what could they be doing with it in the future? This presentation will examine the impact of the ubiquitous digital technology on society by drawing on recent and past news, technological developments, historical developments and global trends. The presentation will finish with an open discussion chaired by Wolfgang Weileder. Benedikt Driessen is also offering to run an open workshop on how we as artists could respond practically to the challenges of digital surveillance. The workshop will start after the presentation at the Fine Art Seminar Room. Benedikt Driessen is one of the leading experts in information security. He specialises in analyzing and exposing weak information security practices in widely used digital systems, e.g. wireless communication. Benedikt Driessen has worked for global technology companies and government agencies. He is also the founding member of the start-up company 'PHYSEC' that develops innovative digital security technology for critical infrastructures such as water and electricity providers. He has obtained a PhD at the Horst Görtz Institute for IT-Security (HGI) in Bochum, one of the leading institutions for IT-security research worldwide. His work has been presented and published in top international theoretical and applied conferences as well as academic journals, e.g. Crypto, Santa Barbara, USA. Currently, he is working as freelancer and digital security consultant.